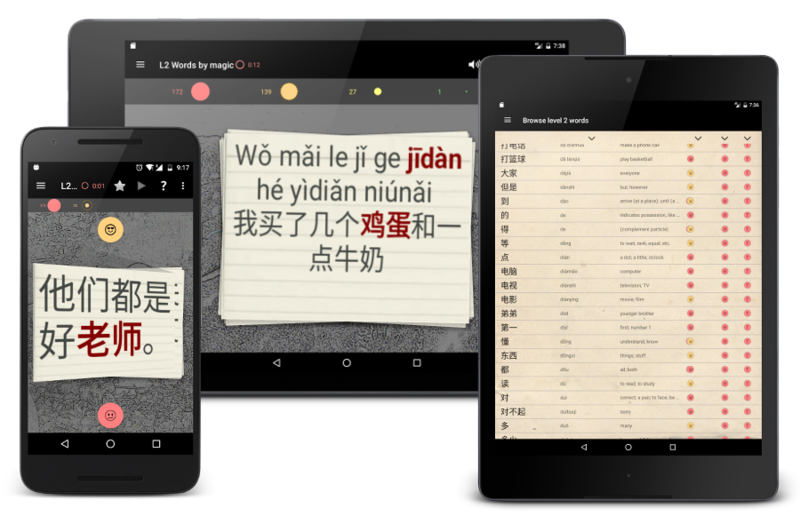 Every HSK word and all example sentences accompanied by native audio. Words sharing the same characters are presented in sequence to aid the forming of connections in memory. Memorizing tones is vital to improving Chinese pronunciation. Learn them with HSKMagic. HSK grammar points are presented in sentence context with links to sources on the web for further explanation. Card choosing algorithm for quick automatic learning. Tricky words have additional links to web sources to speed up memorization. "Very nice Excellent learning tool. Ive tried so many and you might be best "
"Omg thank yooou. My HSK is in a month and i really needed this !! " "I'ved look everywhere to find a tool for learning Hanzi. I found many, which can help. But I find HSK MAGIC the most efficient. " "Very good. It is a pity that this application was not (around) when I started to learn the language." Learn/revise Chinese Mandarin as if by magic. HSKMagic is a Chinese learning tool for phones and tablets, with a focus on the syllabus of the internationally recognized HSK exams. All rights reserved © 2015 Intisol Ltd.